Compare prices from several car hire companies in La Coruña and find the best price for car rental. Our prices always include unlimited mileage and insurance. 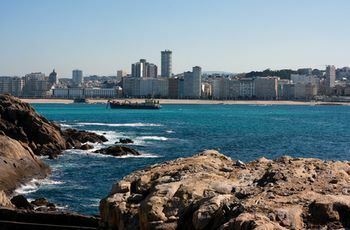 A Coruña is also known as La Coruna and is located on a peninsula in the northwest corner of Spain. The city belongs to the region of Galicia and has a busy port that leads into the Atlantic. During Roman times the city was called Brigantium and live about 250 000 (2008) inhabitants here. More and more tourists visit A Coruña because there are many cruise ships heading into port, in addition to the city limits with beautiful beaches and a long beach promenade. This promenade is about. 10 km long, making it Europe’s longest. Some of the museums located in the city include The Fine Arts Museum, Clock Museum, Clock Museum and an aquarium. A Coruña Airport offers domestic flights and is approx. 8 km outside the city center.